Fra sesamkake til dampede boller er Beijing en by fylt med smak. Lær om de rettene som lokalbefolkningen elsker på denne 3-timers vandringen, kulinarisk tur på nattmarkedet, inkludert 10-15 utvalg av retter, som sørger for å tilfredsstille din appetitt. En privat guide sikrer en personlig opplevelse, inkludert catering til kostholdsrestriksjoner, og enkel logistikk. Møt din guide i lobbyen på hotellet i Beijing kl. 17.30 og reise sammen med taxi (egen regning) til hovedmarkedet. Spaser gjennom hutongs, eller gamle smug, og lære om deres historie når du går til din første spisestue. Ved ankomst til Xinjiang Taste Restaurant, prøv 3-5 forskjellige typer kabobs ledsaget av side retter som aubergine, hvitløk, purre og bønner. Deretter kan du prøve tanjianbing, en smakfull stekt pannekake populær blant lokalbefolkningen. Toppet med en prøve eller Erguoto - en tradisjonell kinesisk hvitvin. Fortsett å gå ned på samme gate for å smake på en rekke andre søte og savoroy-spesialiteter, inkludert sesamkaker, Sichuan-kabobs, peanøtkrem, kalde nudler, dampet riskake og mer. Gjennom hele turen lærer du om hver tallerkes ingredienser og kulturelle betydning fra din guide. Neste stopper du på en lokal restaurant som serverer Yunnan-provinsens tradisjonelle mat. Delight i blomsterkaker, blommevann og "Cross Bridge" risnudler. Prøv deres spesialitet, parabolantennet bambus orm (egen bekostning). På slutten av turen, velger du å bli og fortsett å utforske nattmarkedet eller gå tilbake til hotellet. We LOVED this tour!!! Lucy did a great job!!!! She provided us with much more than we expected! She even took us through the hutongs on our way from one restaurant to the next, all the while providing us with interesting facts and insight into the life and culture in Beijing. This was truly a unique but mot pleasant experience. Jimmy made it a very enjoyable memory. 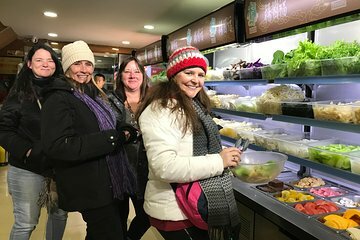 Group of 4 woman greatly enjoyed this food tour. Some of us rather adventurous and others not so much, but all enjoyed. We loved our guide whose name started with a Q. She was funny, organized and shared details of her life. We were stuffed at the end, and feel like we got far more than we paid for. There were definitely more exotic recipes on offer such as turtle shell jelly and dove soup. The sites were very close together, mainly along the same street, so minimized walking. Places visited were definitely local sites. Would recommend to all. Roy picked us up from the hotel and took us via metro into the city! We went to roughly 10 restaurants, which were only locally driven! This was most probably the most interesting and exciting tour we have done in a while. We went to the known local restaurants, to noodle restaurants, to a pig organ restaurants, to a dim sum restaurant and so on. Roy explained to us the cultural differences within China and make sure that we understood everything and anything. Roy was great and I would recommend him! We were met at our hotel by a nice young man by the name of Roy Li. He led us around the houtong where we sampled dishes from many small restaurants. The variety of food was great and the portions were so large that by the end, we really couldn't eat anything more and had to take some of the food to go. Roy was very informative and looked up every question we asked to make sure we would understand his answer. We definitely recommend asking for Roy and taking this tour! It was a great food experience. The only thing I would change is adding something sweet to the tour and we missed a couple of places because they were already closed. This was a good tour and our guide Roy was very helpful and informative throughout. While some of the food was not to our taste overall it was a great way to experience authentic and unusual Chinese food. We really enjoyed this tour and our guide was great! We tried many different foods which we would not find in Europe and would not search out. There was plenty of food for really big eaters so make sure you are hungry before going. The only suggestion would be to offer different food tours as we understand there are also a couple 'snack' streets which would be a nice option as well. This is the perfect tour for someone who wants an authentic Chinese food experience. Our guide Bella was absolutely fantastic! Not only did she take us to restaurants we would have never been able to find let alone order on our own, but she also gave us so much information on the history and culture of Beijing. We went to more restaurants than we could keep track of and we ended the evening so full we could hardly move! This tour far exceeded our expectations! This was excellent. The tour guide took us to taste some amazing food. And some weird food, but it was an experience We were stuffed by the end of the tour.